I believe we found the Vagabonding.com community in the general course of trying to find others who are also traveling full time as a lifestyle. It’s been great to connect with others, and know we’re not alone! Chris hit the road full time in April 2006, and we met a few months later. Cherie joined him on the road full time in May 2007. 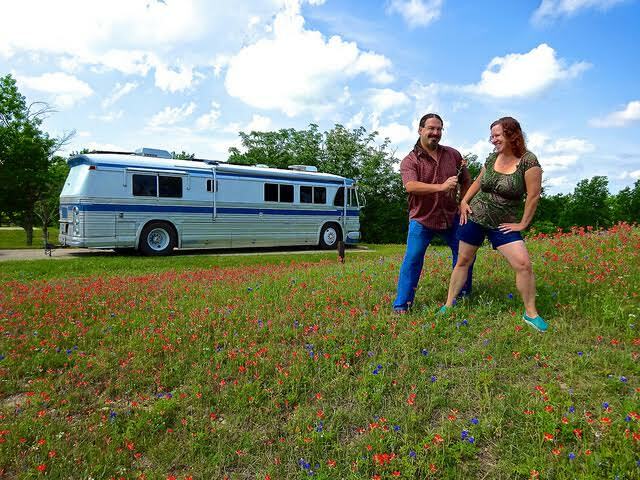 Since our original case study, we parked & sold the 17′ Travel Trailer. For a few months, we rented a small cottage in the US Virgin Islands and then we returned to the states we ​pursued purchasing a 1961 vintage highway bus conversion. For the past 4 years, we’ve been traveling full time in the US while updating and upgrading the bus to become a geeked out vintage classic. We occasionally park the bus, and embark on other adventures – such as this summer we just spent 7 weeks traveling by rail, boat and bus to and from Alaska. We shut down the custom software development business about 2 years ago, after Cherie’s father passed away (it was a family business). We’ve been working since then to shift our income sources over to be more passive as we continued our mobile app development (we now have 3 apps out – Coverage?, State Lines and US Public Lands – all tools for traveling in the US). ​ We have continued to integrate in volunteer work. For the past two years, we volunteered as tour guides at a history lighthouse on the coast of Oregon. We cringe when someone asks us this question still to this day. ​When our current location is no longer our favorite, we move. Suburbs and strip malls are always the most draining places to experience. Yup, most of our pre-trip worries have come true. And you know what? We thrived. We’ve experienced mechanical breakdowns, safety threats, almost running out of gas, inclement weather, getting lost, logistical snafus and more. You just learn to go with the flow and approach things with agility. Once you really embrace that ‘the worst that can happen’ isn’t so bad – it’s all good. Our mobile technology (MacBook Pros, iPads, iPhones) have definitely proven core to our lifestyle and work. And our solar panels keep us charged up and able to work from amazing remote locations without worrying about needing to plug in. Variety, exposure, knowledge, learning, connection, adventure and having no regrets. The more we travel, the more amazing people we’ve been able to meet and connect with. Our quest for community continues, and it’s gotten even more flourishing in the past few years. More and more of our peers are hitting the road, and we regularly meet up with them. ​With tools like RVillage, Instagram, Facebook, Twitter and blogs – we’re all able to keep in touch much easier. So, we’d probably say that one of the biggest challenges of a vagabonding lifestyle, particularly in the US is healthcare these days. Especially as we get older, it will become more of a concern. Our systems just aren’t setup to support a mobile population – it’s difficult to find doctors you trust, and health plans that cover us as we roam. On the plus side, options for self care and telehealth are increasing. What lessons have you learned on the road? Chill, relax, go with the flow, and don’t become overly tied to any set schedule. There is no one right way to do anything. Don’t worry so much.. just do it! Get started, and work out the details along the way. And — don’t get caught up in the details too much. Trust in your ability to adapt, and be present to enjoy the experience. Read more about Cherie and Chris on their website, Technomadia.